When buying and selling products such as pneumatic products and dealing with the concrete industry, it is best to understand some of the terms that are commonly used. While these definitions are not technically specific, these are common ways to understand them. The easiest way to understand PSI is force. Concrete is usually measured in PSI when it is fully cured and at its maximum hardness. One common type is 3000 PSI concrete. This means it takes 3000 pounds to break one square inch of this concrete. Concrete gains more strength by being poured in thick slabs and putting reinforcing steel (rebar or wire mesh) in the concrete. 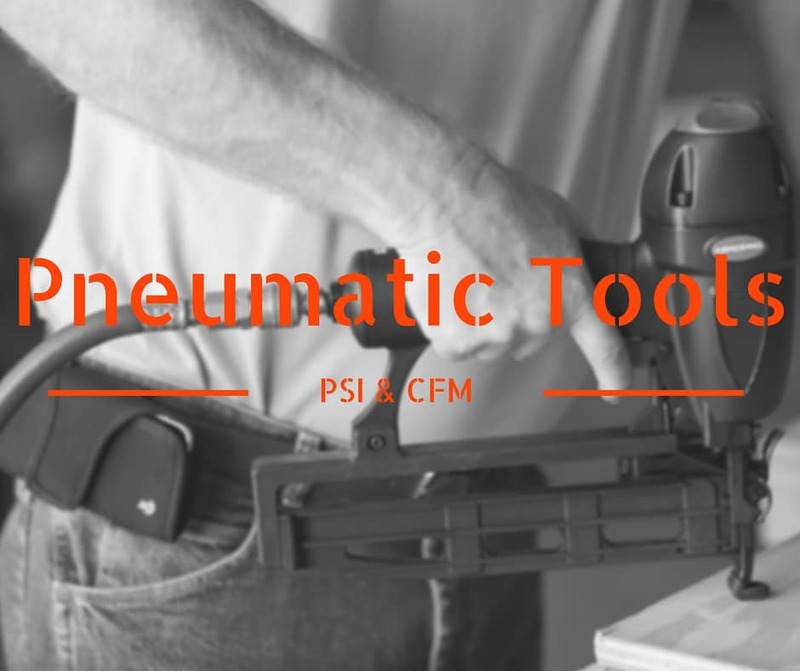 Pneumatic PSI is used to determine how much force it takes to operate the tool. Always check the owner’s manual to determine the operating pressure of each tool. Usually nail guns will have an operating pressure of 80-110 PSI. This means, in this example, the tool will run on 80 PSI and give you good service, but all products are not created equal. The regulator on the compressor can be turned up to a maximum of 110 PSI and give it more force to drive the nail. Pneumatic tools for the auto industry usually follow the same operating pressure guidelines as nail guns. The pneumatic spray guns use considerably less PSI to operate them, but the spray guns can be affected more by our second term, CFM. CFM is best understood as volume. CFM on the tools determines how much VOLUME of the FORCE you need to operate the tool. The starting point of determining how much volume you have is at the compressor. Different tools require more volume, thus requiring bigger compressors. Compressors and tools have the PSI and CFM always posted in the owners manual. ALWAYS check the owners manual for PSI and CFM requirements. The volume on a pneumatic nail gun is much like a spray bottle for glass cleaner. You pull the trigger, a portion of the volume is used quickly and then the gun is idle and not using volume while you are not pulling the trigger. When you use an auto tool such as a grinder, think of it as a water hose. When you pull and HOLD the trigger, the volume continues to come out until you release the trigger. When a tool requires more CFM than the source (compressor) can handle, the result is the force (PSI) will drop below the operating pressure and the tool will not perform as it is designed, or just stop altogether. Again, ALWAYS check the requirements in the owner’s manual. An example of enough CFM would be using a 5 gallon bucket to fill drinking cups. The bucket would perform perfectly and could be refilled quickly to keep filling more cups as needed. An example of not enough CFM if you took the same drinking cups and filled 5 gallon buckets, the cup will start to fill the bucket, but would quickly run out of water (volume). The drinking cup needs to be refilled often and would take too much time to catch up filling the buckets.